Submitted 3 months 1 hour ago by feeds user. The Razor AMG UH-1 represents a new paradigm in holographic sight technology with revolutionary technology, first class energy efficiency, and an impressive sight picture. 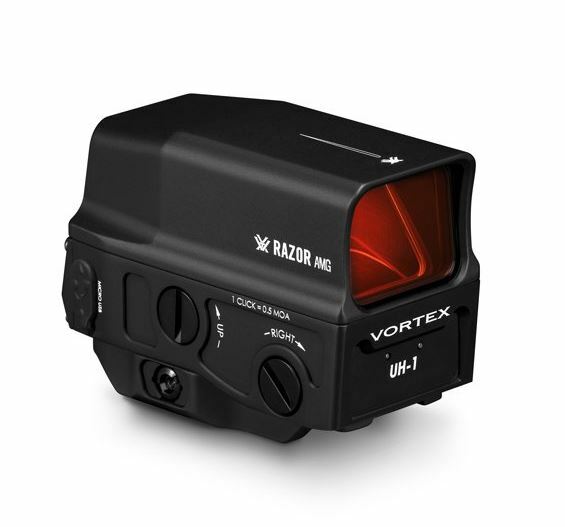 A single fused holographic element with no moving parts delivers a sharp reticle image with zero distortion or fade. Eyepiece glare and visible stray light emissions are virtually eliminated. An ultra-efficient power system produces long battery life and a micro USB port is available for charging when used with a rechargeable battery. An integrated, quick-release mount makes the sight easy to install on various Weaver or Picatinny style bases. Shockproof aluminum base protects all internal components and eliminates the need for a secondary housing. Shatterproof, XR Plus coated windows are scratch resistant with Armortek protection. Interior is argon purged for water and fogproof performance.